The creation of human beings is indeed one of the brilliant works of God, giving freedom to humans to choose between right and wrong, good and bad. It is the very intelligence of humans which differentiates us from other living things in the creation. We are indeed unique. Animals share the characteristic of humans that they tend towards using violence in order to defend themselves. Animals also have instincts. Sadly there are far too many instances of such predatory behaviour being seen in Papua against the indigenous people of the land. Humanity – one would have thought – should have ceased using violence against their fellow beings long before this point in human history. What’s more those nations that call themselves ‘civilised’. It is appropriate that human violence only be tolerated when one nation is faced with an threat to their safety by another nation. So then violence would only be used in a way that is legal under human law (to defend) against that which is carrying out the wrong. However here in Papua violence is being systematically used not against criminals, but against the people. A State has a certain authority recognised in the protection of its community. It is regarded as the ‘protector’ of the people. Instances of the use of violence by a State should only in the context of protecting its people from some threat of harm. Violence should never be used by the State against the community itself. However what has been occurring in Papua in recent times is totally paradoxical to that (notion). Although it is forbidden to openly admit that the Indonesian State is opposing the very community that it is supposed to protect in Papua, the fact is that frequently the Papuan community does feel as if it is being regarded as the ‘opposition’ of the State. Particularly around instances when the State forces its own will onto the people. National policies applied in Papua largely can be said NOT to be representative of the Papuan context, nor the needs of the local community. Often heard on the streets in response is “What is asked for is one thing, what is given is another.” This is a reality. The policies are not in accordance with what is asked for, or even what is wanted and hoped for by the community. It seems likely that violence has been adopted as the one and only ‘solution’ of the State of Indonesia to solving the problems in Papua. At those moments when the community is seen to oppose the will of the State, indeed this seems ever so clear. 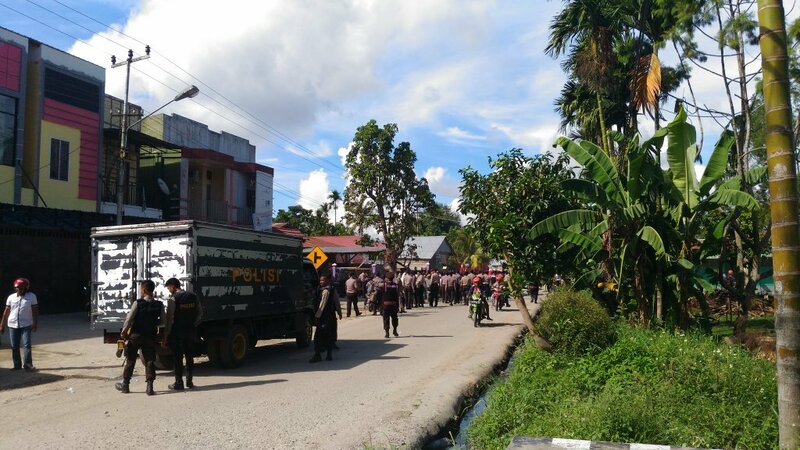 However Indonesia does not seem to recognise that the violence of its agents is having a counter productive result: among its ramifications is that the State will predictably lose legitimacy and the trust of the Papuan community. This is an important matter for the state, which will only be changed by the State having an approach of dialogue and treating people humanely. Obviously we are all human beings and that we should as much as possible be using means that are humane and civilised. Would it therefore not be preferable that when a government (representing the power of the state) is adopting any policy that profoundly effects the community, that they would seek the opinion of that community to be affected, prior to that point? The government must not just hide from its obligations, seeking protection behind legalities of power, with statements like ‘This is in accordance with legal procedure’. They must stop the inherent power games against the community, claiming that ‘This is in accordance with a legal decision, so it must be implemented’. The State must seek to bring about justice and peace for the people, not the opposite! The law is an instrument to be used to attain a civilised state of affairs and good for its citizens, not to be used to spill the blood of the people and create death and tragedy in their lives. The recent human history of Papua is indeed full with the spilling of blood and killing of the Papuan people. There has been absolutely no episode of life for Papuans in this era where there has been a real peace and a lack of violence in the land against its people. The violence itself has become like a little king, a ruler in Papua. Indeed it is no mistake to say that a ‘smooth’ genocide has befallen the indigenous community of Papua. The State violence in Papua is clothed with a smooth, soft touch. Those that commit the acts of violence and create the anarchy wear security hats and are referred to as the so-called ‘protectors’ of the community. This is a fact of what is happening. Far from the ideals of ‘Peacekeeping and protection,’ it seems have been watered down to meaning ‘closing down (cultural) pride actions that might otherwise arise’. It’s up to each of us to interpret what is really going on in relation to those wearing those ‘hats’ in light of the realities in Papua. The Writer sees it as a ‘smooth’ violence, a ‘refined’ violence being committed against the people. This really can damage the sense of peacefulness in the community. Even the justice spoken of in the Constitution of the Republic of Indonesia 1945 is damaged as a consequence of this neglect by the State of its people. The State could try just once in a while seeking the opinions from the community regarding policies in Papua. If the majority of opinions sought were in agreement with the policies, by all means continue to apply them. However if the community does not agree, they must be discontinued. Unfortunately there is no such mechanism as this in existence; It is but utopian as the role of the community should already be represented by the Papuan Legislative Assembly (DPRD). They are the ones in the Indonesian structure which represent the community. There is no use regretting this as this is the mechanism which we chose democratically. The DPRD has an incredibly obvious shortcoming. All manner of aspirations of the people that reach their desk are in one way or another overlooked. As the representative of the community that sits in the most respected of positions it feels indeed like there has been some sort of ‘cutting off’ of a limb. 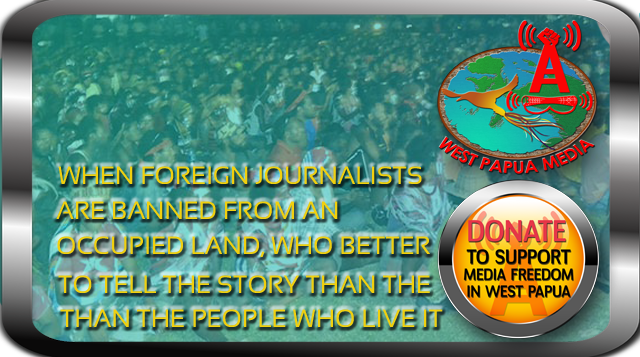 Both attention and partiality of the DPRD towards the Papuan community are severely dulled. It is truly hoped that the games of violence in Papua – whether of the ‘smooth faced’ type or more crude forms of violence against the people – might be questioned. The hats of the ‘peacekeepers and protectors’ must be removed as the proliferation of Indonesian military forces in Papua is not the solution! Violence is not the solution and neither is money the solution. The solution lies in listening to the true desires of the community. Not the wishes of the Papuan government officials who have no genuine concern for the suffering of the Papuan indigenous community. The Author is a Church Worker in Timika, Papua. Translated, annotated and edited by West Papua Media for linguistic clarity. The religious views espoused in this Opinion piece are the author’s own and not necessarily those of West Papua Media.